The winter of 1996 will never be forgotten by two California families. One will remember with extreme joy; my family, with profound grief. After receiving mushrooms that had been gathered in the hills near San Francisco in early February, 1996, a mother used the harvest in the family supper. Within hours of ingesting the mushrooms, she and her three children became extremely ill. Examination of the mushrooms revealed they were highly toxic. With massive doses of antibiotics, the woman and her two sons began to show improvement. But the 13-year-old daughter’s health rapidly deteriorated and her liver began to fail. She was placed on the emergency transplant list. Death was eminent. At last, the family finally received news that a donor match was found for their daughter. That evening, the young girl underwent a transplant graft; one half of a healthy liver was attached to her failing liver. Within days, her liver regenerated, and she eventually made a complete recovery. About two-hundred miles away, in Reedley, a small community in central California, on the morning of February 5th, my teenage son, Scott, made a grave mistake in the woodshop at his high school. An accomplished woodworker already at the young age of sixteen, he placed a wood file between a tool brace and the oak tabletop which was spinning on the face-plate of a lathe. The file jammed and the tabletop shattered. Pieces of oak became projectiles in the woodshop. One 14-inch piece of wood hit Scott directly in the face. Our family was forced to contend with the realities of sudden death. After 30 hours on life support, Scott was declared brain dead. Our family made decisions we never could have imagined – to have our precious sixteen-year-old son became an organ donor. 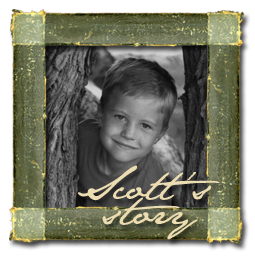 On February 7th, Scott’s liver, heart, kidneys and pancreas were removed to be donated. That evening, a representative from the California Transplant and Donor Network told us some preliminary information regarding the value of of decision. Although no identifying information was given, the representative noted that Scott's liver went to a young girl in the San Francisco area, who was near death after ingesting poisonous mushrooms. I will never forget the winter of 1996. I remember it with profound grief. The evening of February 7th, just twenty-four hours after we said goodbye to our son, my husband and I lay awake; the late night news droned on in front our sleepless eyes. We watched as cameras focused on a helicopter landing on the roof of University Medical Center in San Francisco. Physicians stepped out with a small ice chest, and the news commentator said, “A liver match has been found for the young girl who ingested the poisonous mushrooms.” We watched with disbelief as our son’s liver was carried in that small ice chest to be transplanted into another human being. Their family joyously celebrated the tremendous gift of life for their only daughter, only sister. Our family tearfully grieved the inconceivable loss of our only son, only brother. In the days and weeks that followed Scott’s death, I had nowhere to turn except to my faith in God and His precious Word. It was there that I could take my tears and found that He keeps them all in a bottle (Psalm 56:8). It was there that I felt Him draw near to me as I was brokenhearted and crushed in spirit (Psalm 34:18). I continue to carry this treasure of darkness (Isaiah 45:3) and ask God to show me how I can use my loss for His glory. It is my prayer that through this blog, Redeeming the Future, I can share some of the lessons I learn as I walk this journey of grief; that I can companion others who may feel lost; and that together we can discover pathways through difficult times. Tagged as: "Donor" "Grief" "Scott"
Click here to read Scott's story.